YOUNGSTOWN, Ohio — Have you ever felt stuck? Whether at work or in your personal life, everyone experiences feeling “stuck” at some time in their lives. You might then a take a break from whatever you were doing, hoping that you will gain a fresh perspective later on. But what happens if a business gets stuck? It may sound surprising, but businesses get “stuck” just like people do. The only difference is they cannot always afford to take a break from a troublesome issue and revisit it later. Is your company stuck? What are the red flags? Sometimes people are afraid of presenting new ideas for fear of appearing stupid in front of the others. Or people stop generating new ideas as soon as they hear one possible solution. Dr. Roger Firestien, senior faculty member of creative studies at Buffalo State College, believes innovative solutions only come by generating many, many ideas because the first third are often common ideas, the second third are often silly ideas, and the final third are the potentially unique and useful ideas. This is why companies should not dismiss ideas that might be considered outrageous because it’s those ideas that might lead to out-of-the-box solutions. Dr. Marsha Huber, accounting professor at Youngstown State University, explains that innovation often happens on a continuum. “Companies have two groups of people – adaptors and innovators. Adaptors work within the existing ‘systems’ to bring change at an incremental, low-risk pace. Innovators, on the other hand, believe in disruptive change which is often messy and riskier,” says Huber. Sometimes, companies try to hire new or younger employees to bring change but that can backfire. “Research shows that companies usually ‘regress to the mean’ meaning new hires will often become more like those in the existing culture or will leave to find a culture that matches their innovation preference,” says Huber. So how then might a company overcome regression to the mean? Creative Problem-Solving (CPS), is a technique that guarantees innovation will happen every time you use it. “The technique is both robust and versatile,” says Huber, a CPS consultant. It can help businesses save money, solve stubborn problems and guide managers in clarifying visions and goals for the future. General Motors, after one CPS session, identified a chemical found in nonstick cooking spray that lead to more efficient production efforts, saving the company $50,000 per week after implementation. The Los Angeles Times set a strategic vision after a highly energized and motivational CPS meeting. The Small Business Development Center at YSU clarified its challenges, brainstormed and developed ideas, and set an implementation plan after a private CPS session led by Huber. “It’s been said, ‘You don’t know what you don’t know.’ CPS revealed creative thinking in our staff to help us formulate a new outlook and approach to our SBDC work,” said Pat Viesz, director of the SBDC at YSU. The CPS process helps individuals and companies redefine problems and opportunities they face, come up with new and innovative responses and solutions, and take steps for action. 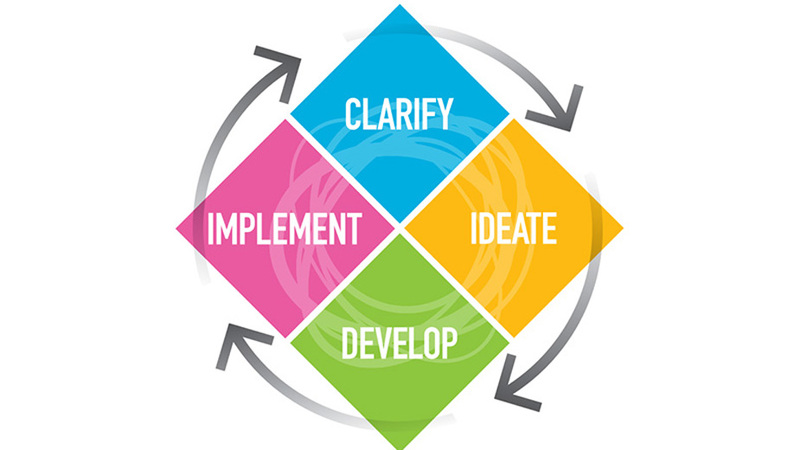 CPS consists of four stages: Clarify, Ideate, Develop and Implement. Similarly, every person tends to operate in one or a combination of the four stages. Clarifiers shine in the first stage asking lots of questions to identify the true nature of the problem. Ideators enjoy generating many original ideas for addressing challenges. Developers want to build on the best ideas and overcome obstacles. Finally, implementers area action-oriented, doers, who want to accomplish the task. Each person — whether a clarifier, ideator, developer or implementer — has different strengths and weaknesses. Knowing these differences can lead to better teamwork and reduce animosity among teammates. So how can businesses become unstuck? Companies should consider developing an innovative mindset. Adopting CPS techniques will help promote an innovative culture as employees use both divergent and convergent thinking to solve problems. The SBDC will be offering a series of workshops on innovation and creativity over the next year. The first one takes place tomorrow. “It will be a “high-energy workshop where participants gain insights into their unique creative-thinking skill set and learn a proven set of creative principles and tools that can immediately be applied to the workplace,” says Viesz. The SBDC will also be offering private in-depth CPS consulting sessions for regional companies who want to solve problems and foster an innovative culture in 2019. You can sign up for the CPS seminar at: cpsatysu.eventbrite.com. Editor’s Note: The author, Joseph Scott, serves as a Certified Global Business Professional at the Ohio Small Business Development Center and is an MBA degree candidate at Youngstown State University.